baking had also been very, very soft. I wasn't sure just what had happened and at first faulted my roaster oven. To be safe, I put the four bars of clay from this batch aside to use on display pieces or items I knew I would be painting. This little piece which I cured last night, was sculpted from two separate samples of Prosculpt Baby from two different bars...both clays were the same colour before curing. 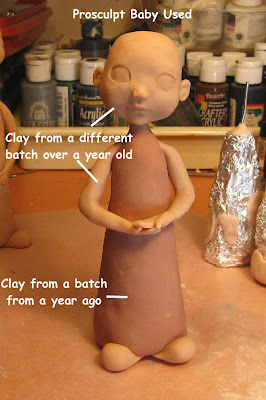 The clay I had used on my faerie is the darker clay in the pic. The lighter clay is from a batch that I had purchased just previously to purchasing the 'bad' batch. Thickness was the same for most of the sculpt, excluding the arms which were solid clay. I think this proves that there was definitely something wrong with some batches of Prosculpt Baby which were manufactured at this time. Do you think this has anything to do with the reformulating without those pesky phylates? I've found this to be true with Super Sculpey. The last couple of times I've used it, I've found that there aren't the moons I saw before (and stopped using it because of them), but I had to bake it at a lower temp or everything was brown! Possibly still trying to get a good mix? Seems they would wait to market it until the kinks are out, but it may be the problem? reformulate due to the phylates. Fortunately, I only have 3 bars (have used the fourth one) left of this clay and I can still use it for other applications than skin-showing ones. Hmmm, interesting happening! Whatever caused it, that's still a really cute figure Sue! Sue, these little guys you are creating are adorable. I can't wait to see how you paint them. As for the clay...that is very interesting and I guess you never know what is going to happen. As Cindy said about Super Sculpey, I too haven't been getting moonies, epecially with my newer batches that I have purchased. The older batches, yes. Curious thing happening here? I used a mixture of super sculpy and preemo but notice slight variations in color from one batch to the next, and have to make sure I have enough of the same of one batch for a doll especially if the color of the clay will show through, like on the face. I do know the more I condition the clay the lighter it becomes this is do to really getting the placetisizer(sp) throughly blended in. The only time I've had a problem with moonies(which is just air trapped beneath the clay) is if I haven't conditioned the clay long enough. So I mix, mix, mix... Also I really push and blend the clay as I sculpt. Some other artists I spoke with think the moonies are do to damper conditions.I personally think it's do to not conditioning and working the clay enough, as I've worked through many a rainy day with no problem. You can see the moonies before you bake, and if pricked with a pin, and reworked before baking they will disappear! Just my 20 some years experience with it! It's all trial and error and each batch is slightly different. Thank you for your tips and info Gail! had this colour change problem it was rather discerning, as I had consistently not had problems with this clay. eliminate the chance of any moonies and I agree that conditioning the clay is so important! Wishing everyone a fabulous and creative weekend! These guys are going to be great! There is some good info going on here. It pays to come back and read comments. You never know what you might learn. Have a great weekend! I was just practising after not having done anything with clay for months... so... I think I'll toss it and get some new Sculpy... I also have some Prosculpt to try. Where do you get yours in Canada? Sue, your blog is wonderful! Great information ladies, thank-you for sharing! This is a really good subject of discussion, as all winter I myself have combated the moonie dilema too...Off to check out the rest of your blog.